Check out our review of the LG G2 smart phone. 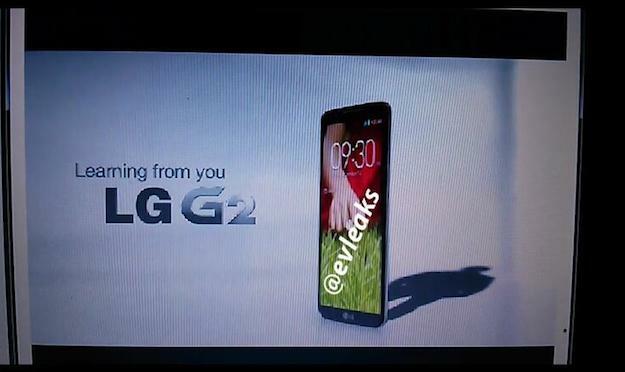 A phone which may be the LG G2 has shown up in a series of leaked images, published on the @evleaks Twitter account. In case the G2 isn’t familiar, it’s the name expected to be given to the device we previously knew as the LG Optimus G2, following news LG is likely to drop the Optimus name from its high-end hardware. There are four pictures in total, and they appear to have been lifted from a promotional video for the device. 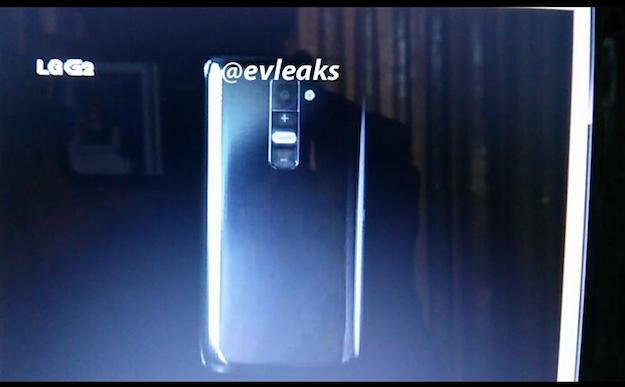 The first shows a side-on view of the phone with the words, “Learning from you, LG G2” next to it. Next is a picture of the phone’s rear panel, and below the camera lens appears to be a vertically mounted volume up and down control. This is then shown again in pictures three and four. Putting the volume controls on the back of the device does make some sense, as raising or lowering the volume during a call could be easier this way, but less so when playing a game in landscape orientation, or when the phone is face up on a table. There appears to be something in-between the buttons too, although it’s impossible to make out what it is. A touchpad for scrolling, perhaps? A fingerprint security scanner? Going back to the first image, the profile looks very slim, while the shape is reminiscent of Samsung’s Galaxy S4; however it doesn’t look like there are any hardware buttons below the screen, not even a home button. Could this have something to do with what’s in-between the volume keys? We may not have long to go until all is revealed, as LG has called a press event for August 7, and smart money is on it unveiling its 2013 flagship Android device. Previous rumors have linked the G2 with a flexible screen and a Snapdragon 800 processor, which following the announcement of the Xperia Z Ultra and the LTE-A Galaxy S4, seems more and more likely. We’ll bring you all the news on the day, and any further rumors in the meantime.